A pretty straight-forward idea, MP3 Quality Modifier is a superb at saving you hard drive space by modifying the bitrate quality of your mp3 files in a batch process. The program allows you to drag-and-drop files in to the application and then gives you the option to modify the bitrates of your mp3s from either high quality (and higher sizes) to lower sizes with a drop in quality. To some these changes are noticable and to others they aren't, depending on the bitrates you choose. The interface of this program is actually quite simple and elegant. Version 2.53 is a freeware program which does not have restrictions and it's free so it doesn't cost anything. 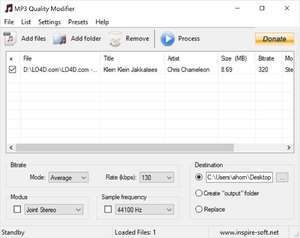 For security reasons, you should also check out the MP3 Quality Modifier download at LO4D.com which includes virus and malware tests. Additional screenshots of this application download may be available, too.